You’ll All Feel Inverted After This. What do you think of when you hear the words F-14 Tomcat? Top Gun. Finish this sentence. “Because I was ________.” Yes, inverted. There’s no doubt that 1986’s Top Gun is permanently engrained in our psyche. These opening lines prove that. We are after all aviation fans and we’re yet to meet someone who hasn’t seen it. It was the movie that made people aware of how badass fighter pilots really are and actually inspired many people to become pilots or at least join the Air Force. Now 30 years later (yes, we’re old,) we got wind that Top Gun 2 is in the works. 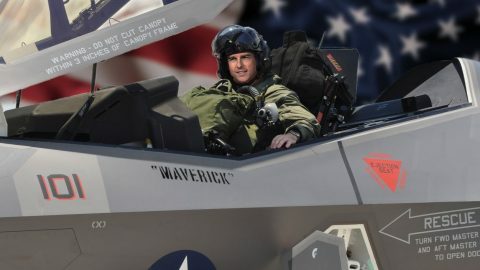 Appearing on Jimmy Kimmel Live!, the host and Tom were reminiscing what it was like to shoot Top Gun. We got a clip of it below. Give it a watch as you’ll find out many secrets of that movie that not many people know. When referring to Jerry, he of course meant Jerry Bruckheimer, the film’s original director. Also, and this is the bombshell, when asked about who will/would be in the sequel, he said, “Goose won’t be coming back unfortunately… sorry.” He said he won’t even be back in flashbacks, so if you think about it, that’s solid proof that they’re fleshing it out. Then again there’s that tweet we found from earlier this years too. Getting excited yet?